A common complaint about trainers from bodybuilders, powerlifters, and others in the know is that they tend to focus on gimmicky, ridiculous exercises. Walk down to your local Planet Fitness, Gold’s Gym, or 24 Hour Fitness and take a look at what routines trainers are building for their clients. Odds are the clients are standing one-legged on a bosu ball, doing endless amounts of curls with 5lb dumbbell. Odds are the clients are doing low-weight, high-rep routines. And odds are that, by the end of the training session, the client will have never set foot in a squat rack or used an Olympic lifting platform. The “WOW” factor: Let’s face it — to someone who’s never set foot in the gym before, what looks more likely to get you in shape? A Pendlay row, or standing on one foot in the lotus position on a bosu ball between bouts of stepping up on a bench, rapidly curling five pound dumbbells? One of the most unfortunate misconceptions in the fitness world is that more complicated routines are necessary to get in shape. When it comes to resistance training, more is less. Doing complicated high-rep, low-weight movements serves only to confuse and is ineffective at building muscle. In fact, one of the most effective routines for beginners, Starting Strength, involves only three exercises a day. Fear of scaring off clients: I’ve seen many trainers at my gym have their clients doing machine-only routines, only to find the same trainers a couple hours later doing their personal workout using the free weights! Why is this? Well, many people are still under the misconception that lifting heavy weights makes you “big and bulky”, and most novices come into the gym with the idea that they want to “tone” their body. The trainers, not wanting to disappoint, leads the client towards the machines, even though they may know deep down that machines are less effective. If only it was common knowledge that the real way to “tone” is big, compound movements combined with intense cardio. Safety: Gyms have a large amount of liability. It simply isn’t worth it for most trainers to show clients exercises that actually work, because these are often perceived as dangerous. Just like almost everything trainers do, this is actually counter-logical, because compound exercises done with correct form can actually help to correct muscle imbalances, preventing injury. 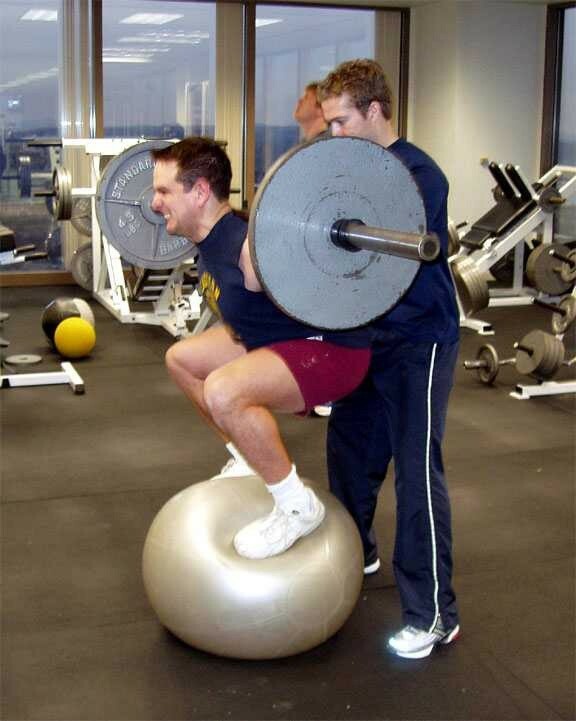 Oh, and don’t tell me that hopping around on a bosu ball is safe, either. Increased reliance on a trainer: If you learn proper form for simple, effective strength-building movements, you’ll start to gain a sense of independence, which means the trainer will no longer be getting your business. As Reneé DeFranco notes, “Trainers are sometimes told not to spend too much time teaching clients how to use the big equipment for fear that once they get comfortable, they’ll want to go it alone. That’s why trainers might emphasize coordination exercises and rely on smaller props like stability balls, resistance tubing or bands, and balance tools, the three types of gear most frequently used by trainers”. For a job that entails clients to place nearly all trust in an authority figure, it’s maddening how little enforcement and standardization there is in the realm of training certifications. No certifications? NO PROBLEM! Just be strong enough to put these dumbbells away and we’ll set you up with this nifty red shirt. Even if you’re lucky enough to get a trainer with a certification from one of the many (70+) organizations that provide credentials, there is no telling how reputable the certifying organization is. While more respected programs, like those from the the National Strength and Conditioning Association, gruel examinees on biomechanics, body chemistry, and psychology, other certifying organizations require a simple online test or a weekend course. One of the causes of this is a lack of a reputable, third-party accrediting body for programs. As the fitness industry continues to squabble about which one to use, clients get the short end of the stick. As much as I hate to suggest it, I’m starting to believe that this is all a giant conspiracy. Trainers play into the business model of a gym — get as many people paying a monthly fee, but not actually using the facilities — as possible. If they really showed you how much fun working out could be via compound and Olympic lifts, you would actually use the facilities. Training sessions can run up to $100 an hour, money that could be better spent on supplements, food and proper workout shoes. As a general disclaimer, I should say that, like many things in life, I made a lot of blanket statements in this article to prove a point. There are trainers out there that are worth their salt. Many of these can be found at your local independent Crossfit, kettlebell, powerlifting, or strongman gym. Good trainers at “big box” gyms are few and far between. Leads you towards machines and away from free weights. Makes extensive use of the bosu ball and resistance bands in what could be best be called “circus” exercises. Can’t explain the biomechanics of a squat. Can’t explain their reasoning for their exercises or routine choices. Tells you that squatting below parallel is “bad for your knees”. Gossips with you about personal problems. Spends more time talking with you than training you. Conversely, spends more time looking at the clock, or a cell phone, than training you. Doesn’t have a notebook to record your progress on lifts. Feels the need to assist you on every lift. Does not warm you up before starting you with your working weights. Doesn’t have a certification, or has taken an online test or a weekend course for a personal training certificate. Puts you through sadistic, “The Biggest Loser” inspired workouts while ranting or yelling at you. Tries to sell you supplements. Has no knowledge of nutrition. Can’t demonstrate past client success. Has no plan — makes up workouts on the spot. So, if you can’t use a trainer, and you’re still a beginner, where do you get your knowledge from? Luckily, you’re living in an age where more fitness information is freely available than ever before. In September 2006, I started Mark Rippetoe’s Starting Strength without ever having picked up a barbell in my life. For form advice, I compared myself to ExRx GIFs and YouTube videos. For more general feedback and information, I took advantage of the newly-formed Watch and Weight subforum on the Something Awful Forums. Sure, it helps to have a gym buddy, but a face-to-face training session is not a necessity to get results anymore. Load up YouTube, read the guide, and join a fitness community to get feedback, and you’ll be on the train to swoleville in no time.